Author Kahnweiler's first-of-its-kind practical five-step process helps introverts and extroverts understand and appreciate each other's wiring, use conflicts to spur creativity, enrich their own skills by learning from the other, and see and act on things neither would have separately. Kahnweiler shows how to perform the delicate balancing act required to create a whole that is exponentially greater than the sum of its parts. Mick Jagger and Keith Richards created the music of the Rolling Stones. Steve Jobs and Steve Wozniack built Apple. Alan Jay Lerner and Frederick Loewe brought us iconic musicals, including Camelot and My Fair Lady. Gene Siskel and Roger Ebert were America’s most popular movie critics. All of these famously productive partnerships had one thing in common: They brought together an introvert and an extrovert. The common wisdom is that introverts and extroverts do not work well together. 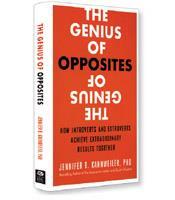 The common wisdom, as author Jennifer Kahnweiler makes clear in her new book, The Genius of Opposites, is absolutely correct in the sense that the collaboration is often going to be contentious and difficult, filled with battles and miscommunications and sometimes deliberate sabotage. Somehow, however, the introvert/extrovert partnerships such as those cited above, as well as the many unknown partnerships that fill Kahnweiler’s book, produced extraordinary results. The key to such success, according to Kahnweiler, is the five-step process at the heart of her book. The first step, Kahnweiler argues, is to accept the alien. If introverted and extroverted people want to partner, they have to realize that they will never change the personality of the other person. Instead, each partner has to make a conscious effort to understand the other. The second step is to bring on the battle. Kahnweiler explains that battles don’t have to be avoided (unless, of course, they destroy the partnership). Instead, they can be the means through which each partner is challenged by the other, resulting in solutions that are better than those that might have been developed individually. The third of Kahnweiler’s steps is to cast the character. Because there are two very different personalities in the partnership, partners should take on the roles that best fit their unique personalities. Kahnweiler’s fourth step is to destroy the dislike. It’s easy for two people with such clashing personalities to develop deep animosity toward each other. They must work, instead, on learning to respect and like each other as much as possible. The fifth and final step is that each can’t offer everything. Introvert/extrovert consulting partnerships are often powerful because neither partner could offer clients all they want — but the two partners working together are able to present a much more diverse but complementary product or service. For each step of her ABCDE methodology, Kahnweiler covers why that particular step is important, the pitfalls that can break down the step and the solutions that ensure success. Bring on the battles, for example, is important because the energy and creativity that emerge from constructive conflicts are best for the organization and lead to better solutions. Also, Kahnweiler writes, a major conflict can actually be a turning point in the relationship, paving the way to a productive collaboration. Kahnweiler warns, however, that battles can also deal fatal blows to introvert/extrovert collaboration, for example, if one partner considers him- or herself more important. Hiding your concerns is another way that battles can be fatal, according to Kahnweiler. If partners don’t bring out the “elephant in the room,” the result — passive-aggressive behavior from the extrovert and internalized resentment from the introvert — can eventually destroy the partnership. Battles can be productive, however, with a little work from each partner. Clear communication, bringing in a third party to break through an impasse and taking time-outs will help conflicts from degenerating. The Genius of Opposites is an important manual for partners with clashing personalities who never want to become too unhappy to fight.